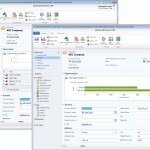 If you are planning on upgrading from Dynamics CRM 4.0 to CRM 2011 you will definitely want to download this tool. 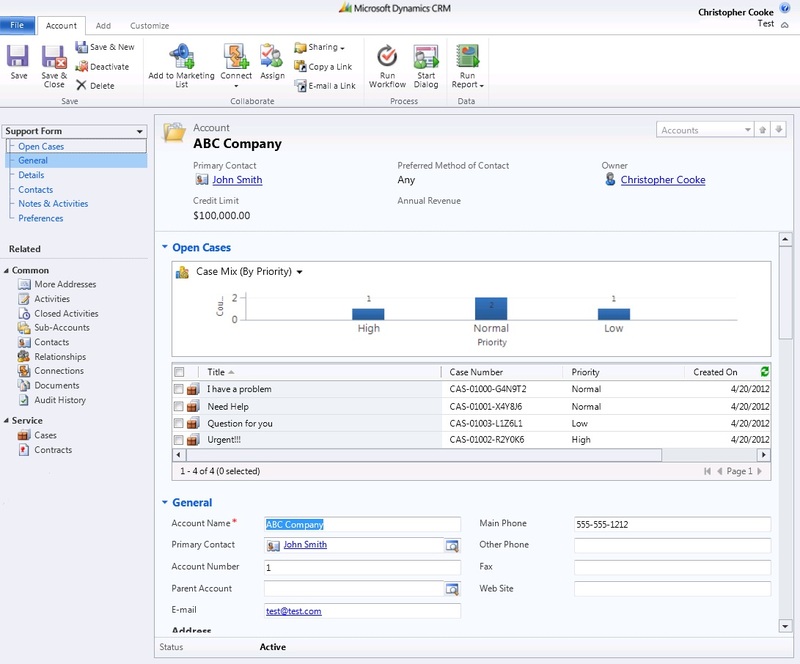 Microsoft did an excellent job with the upgrade process for upgrading an organization from CRM 4.0 to CRM 2001. 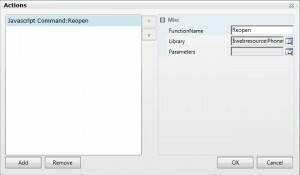 You should test any custom programming like custom workflows and plugins, as there are some oddities to the backwards compatibility of the SDK. But, for the most part upgrading is a seamless process with one exception, Form Scripts. 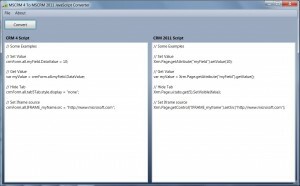 There were some major changes to the object model which will cause nearly all form scripts to break when upgrading from CRM 4.0 to CRM 2011. 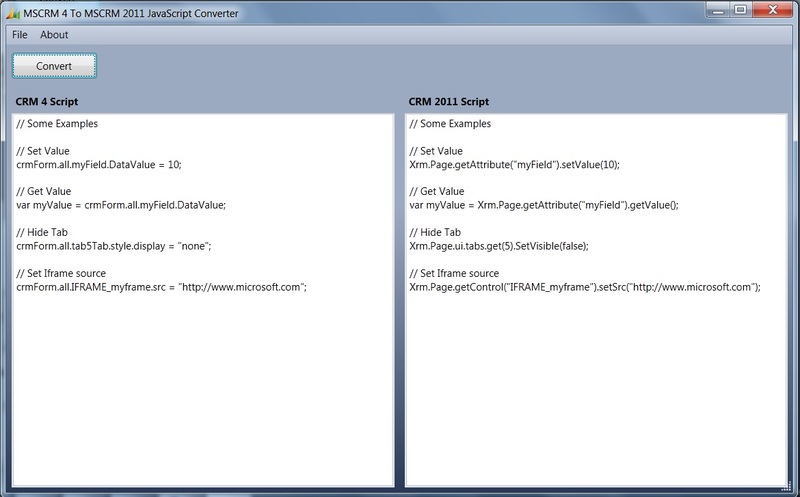 Luckily there is a conversion tool available which will convert your CRM 4.0 Form Scripts to the new format for CRM 2011. It will not fix 100% of scripts, so you will need to test each scripts. But it will take care of the bulk of the work for you. 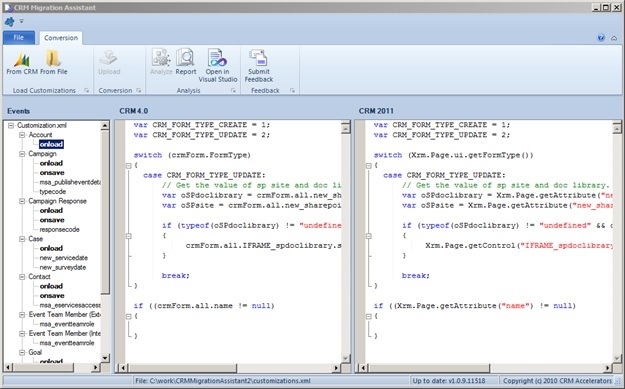 When you go through your scripts you may also find that some of them are obsolete now because of features added in CRM 2011. 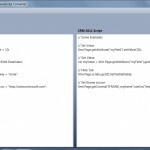 Like scripts for hiding fields based on a users security roles, which can now be handled through Field Level Security. 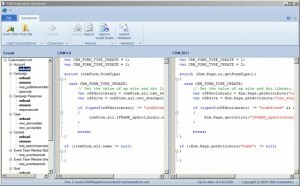 You can purchase the CRM Migration Assistant from http://blogs.infinite-x.net/crm-add-ons/crm-migration-assistant/ . There is also a trial version which will let you try it out and convert just the Accounts and Contacts. 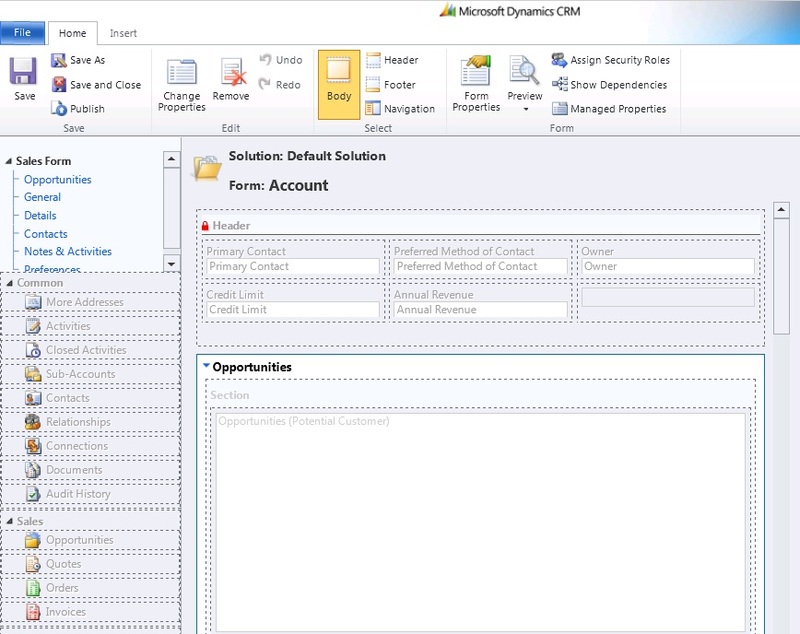 One of the many features added in CRM 2011 was the ability to setup Multiple Forms on a single entity. 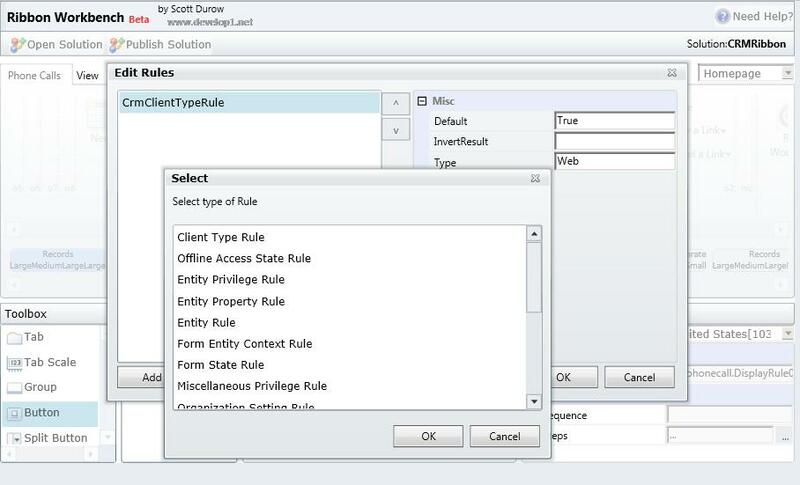 This feature includes the ability to display specific forms to different users based on security role. So no need to setup form scripts to check a users role and then hide fields or sections on the form. You can just create separate roles and assign security roles to each of them accordingly. 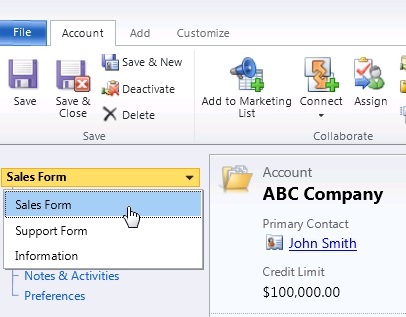 An extra bonus you will see if you reduce the number of fields on each form is added performance as the clients will have less controls to create and data to load. 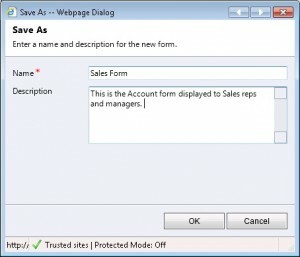 Here’s how you can setup Multiple Forms. 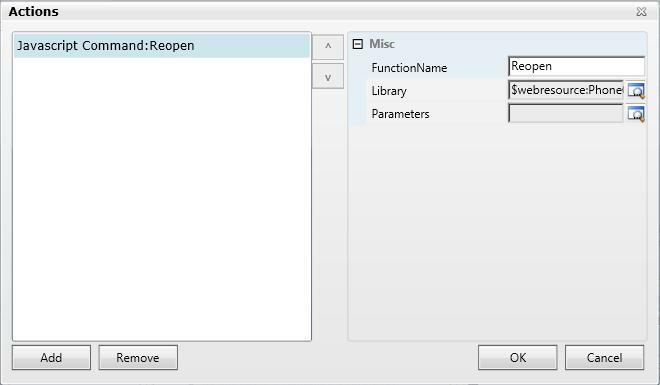 To create a new form, simply Open your Main Form and Click on Save As. Then Give your new form a name and Click Ok to create your new form. Now you can Edit the new form. Since we called this form Sales we will add a Chart of Top Opportunities. Next, You can repeat these steps to additional forms. Like a Service Form with the Open Cases for Customer Service Reps and Managers. 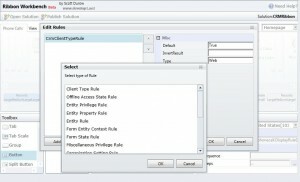 You can control the access to each of the forms by selecting a form and pressing the Assign Security Roles. Here we will assign the Sales Manager and Salesperson to the Sales Form and assign the CSR Manager and Customer Service Representative to the Support Form. 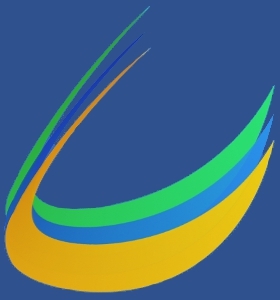 Publish your changes and then anyone with the Sales Managers or Sales Persons will see the Sales Form while anyone with the CSR Manager or Customer Service Representative will see the Support Form. If you have rights to more than one form you can switch between the forms using the form drop. 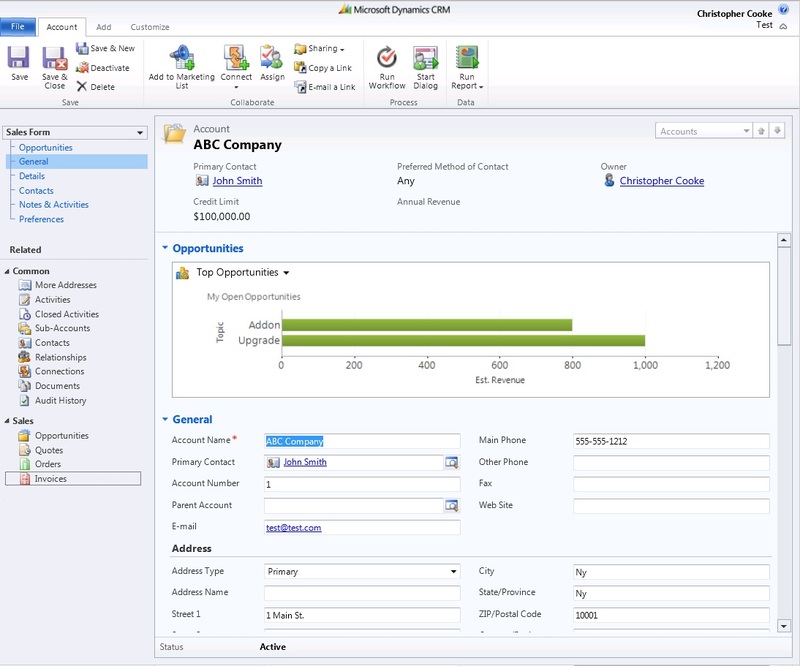 One of the most common complaints when moving from CRM 4.0 to CRM 2011 is “Where did the Form Assistant go for creating follow up phone calls”? Luckily Zero2ten has developed a solution that gives you the ability to easily create a follow-up call. 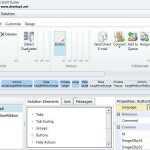 This solution adds a section to the phone call form where you can specify information to create a follow-up phone call. When the new call is created it will also copy the notes from the previous call over for you. 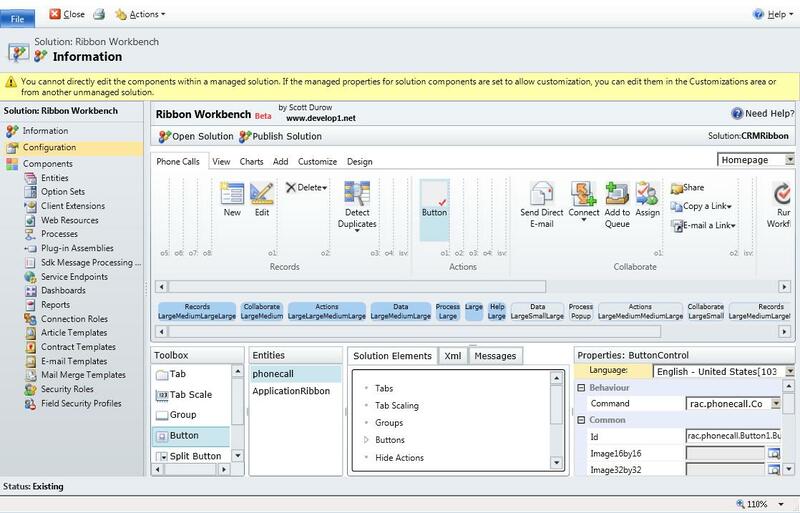 You can even use the phone call assistant to create reoccurring phone calls.